Manufacturing the material your project needs. Engineered to exceed your expectations. With a worldwide emphasis on sustainability and eco-friendly products, traditional fiberglass and shoddy materials are not fulfilling green design expectations. CMS acoustical products provide superior performance, yet are made from a minimum of 70% recycled and renewable fibers. CMS acoustical products are an innovative alternative to traditional fiberglass and synthetic acoustical and thermal panels, and are true performers in a variety of different applications. Capable of manufacturing a wide range of thicknesses, 0.25”-5.5”, and densities, 1.4 – 13.0pcf, CMS can develop and manufacture a material solution that will fit your particular needs. CMS products can be used in any area that calls for acoustical or thermal treatment and can even be covered in-line with fabric or other decorative materials including foils, vinyls, laminates and other finishes. CMS cellulose panels readily accept paints and inks, allowing for virtually unlimited graphic design possibilities in conjunction with your digital plotters. Plus, cellulose panels pass BIFMA tackability tests making them an ideal choice for the workplace. CMS products can be delivered in standard 4 x 8 size or can be custom cut for unique applications. Widths can be up to 98 inches (2.48 meters). Most CMS acoustical products containat least 70% recycled and renewable fibers, the majority of which is post-consumer recycled newspaper. The manufacture of CMS acoustical products produces zero scrap. In addition, customized recycling programs can be set up to recycle CMS acoustical products. 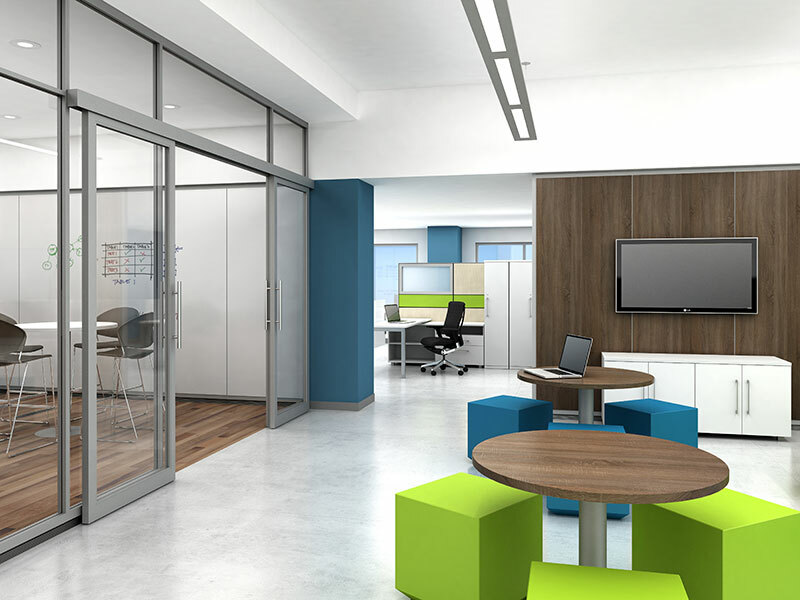 Photo features Trendway Furniture: Volo Moveable Walls with T51 Seating and Jet Seating. 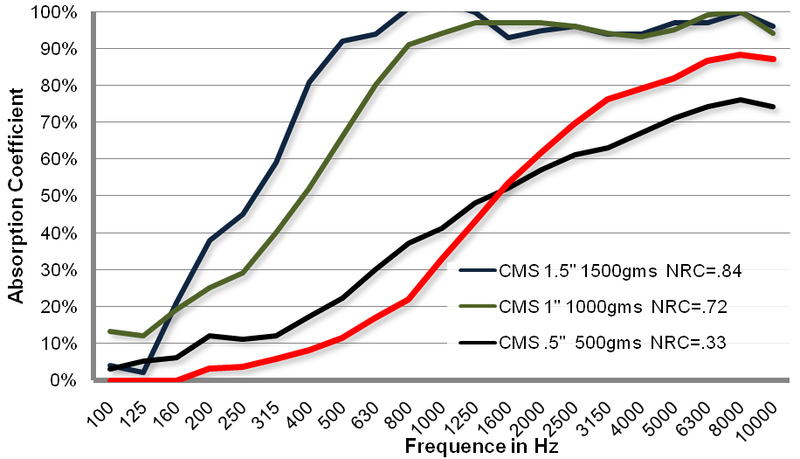 The unique, structural design of CMS acoustical products increases sound absorption to control and deaden sound transmission. CMS acoustical panels achieve high Noise Reduction Coefficient (NRC) ratings based on the density specified, typically achieving a 1.0 rating at 2” of thickness. Testing for Sound Transmission Classification (STC) ratings has been done for specific applications. STC values are determined by testing all components of an assembly. In assemblies utilizing CMS materials, the STC ratings typically exceed the values attained with other commonly used acoustical materials. By combining the green attributes and acoustical performance with CMS’s ability to make a product tailored to a customer’s specific application, CMS creates a winning combination for customers.